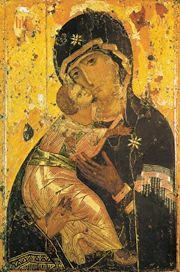 The sole purpose of Orthodox Christianity is the salvation of every human person, uniting him to Christ in the Church, transforming him in holiness, and imparting eternal life. This is the Gospel, the good news, that Jesus is the Messiah, that he rose from the dead, and that we may be saved as a result. The Hospitality of Abraham, an Old Testament pointer toward the Holy Trinity. God is not an impersonal essence or mere "higher power," but rather each of the divine persons relates to mankind personally. Neither is God a simple name for three gods (i.e., polytheism), but rather the Orthodox faith is monotheist and yet Trinitarian. The God of the Orthodox Christian Church is the God of Abraham, Isaac and Jacob, the I AM who revealed himself to Moses in the burning bush. The second person of the Holy Trinity, the Son of God, begotten before all ages by the Father without a mother, was begotten in time by the Virgin Mary the Theotokos without a father. 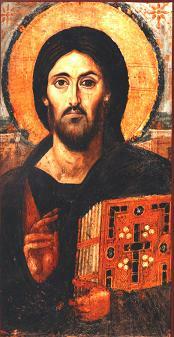 He is the Logos, the Word of God, and he became flesh and dwelt among us, as says the beginning of the Gospel of John. Jesus Christ is God in the flesh. This is the doctrine of the Incarnation, that God became a man. Our Lord Jesus is the Theanthropos, the God-man. He is not half God and half man, nor is he a hybrid of the two. Rather, he is fully God and fully man, perfect in his divinity and perfect in his humanity. He has two natures, joined together in the Incarnation without mixture, division, or confusion. As a result of being fully God and man, he also has two wills, one human will and one divine will to which the human one is submitted. He has two natures yet remains one person, one hypostasis. Jesus is God, the second person of the Holy Trinity. He is the I AM revealed to Moses. He is the way, the truth and the life. He is the God before the ages, come to Earth as a little child and then died on the cross as a man and rose from the dead. He and the Father are one, for he is consubstantial with the Father. During his passion and death on the cross, one of the Trinity suffered in the flesh. He is the Messiah, the Christ—the Anointed One of God, foretold by the prophets of the Old Testament. He is the Savior of the world, the Lamb of God, the Son of Man. As described in the Gospels, Jesus Christ was born of a woman, grew into a man, preached, healed, taught his disciples, died in physical reality on the cross, and then rose bodily from the dead on the third day. He then ascended into Heaven and sat down at the right hand of the Father. Of all mankind, he alone is without sin. His work on Earth was for the purpose of saving mankind, for the life of the world. Everything he did was for our salvation, from relating parables and being baptized by the Forerunner to his glorious death and resurrection. Because of who he is and of what he did for us, we have the opportunity to become by grace what he is by nature. That is, we can put on the divine, becoming partakers of the divine nature. The Church is the Body of Christ, a theanthropic (divine-human) communion of Jesus Christ with his people. The sole head of the Church is Christ. The traditional belief in the Church is attested to in the Nicene-Constantinopolitan Creed as the one, holy, catholic and apostolic Church. By this is meant that the Church is undivided and not many (one), sanctified and set apart for the work of God (holy), whole and characterized by fullness and universality (catholic), and has at its essence the going out into all the world to preach the Gospel and baptize the nations (apostolic). The community of the Church is the locus of salvation for mankind; it is truly the Ark in which mankind may be saved from the flood of corruption and sin. In it, Christians sacramentally work out their salvation with fear and trembling (Phil. 2:12), worshipping the Holy Trinity in spirit and in truth. The Church is the pillar and ground of truth (I Tim. 3:15) and thus may be relied upon in the Christian's struggle to apprehend the one truth for himself. The Church is eternal, and the gates of Hell will never prevail against it (Matt. 16:18). The Church consists of the prophets and saints of both the Old and New Covenants, the angels and the concrete, historical community of believers in this earthly life. Those who have gone on before us are known as the Church Triumphant, while those in this life are known as the Church Militant. The boundaries of the Church are ultimately known only to God himself, but outside the historical context of the Church—that is, the Orthodox Church—the nature of the connection of any human being to the Church (whether a believer in Christ or not) is unknown to us. Throughout Church History, various groups have broken from the Church, a tragic reality which does not divide the Church but rather divides believers from the Church. The final status of Christians in such communities is dependent on God's mercy and grace, as is the case with those with membership in the Church in this life. The central location in Holy Tradition is occupied by the Holy Scriptures, the written witness to God's revelation in the Church. As such, the Scriptures are always interpreted from within the Tradition which was the context for their writing and canonization. A bishop lifting his hands in prayer during the Divine Liturgy. Worship in the Orthodox Church is understood to be the highest calling of mankind, to fall down at the feet of the Almighty God, the Holy Trinity, and to be given over entirely to him, becoming united mystically with him in the holy mysteries. To worship God is to fulfil the purpose for which we were created. Orthodox worship is liturgical, that is, following specific ritual patterns and cycles in reverent dignity and embracing the whole of the human person. Its reverence and awe are due to its being understood as entering into the very throne room of the Creator. Orthodox worship is transformative in its nature, bringing the Christian more deeply into communion with God and with his cooperation changing him into a holy person, a saint. A secondary but essential component of worship in Orthodoxy is to teach the dogmas of the faith, forming the Christian in the doctrines of the Church. The center of Orthodox Christian liturgical life is the Divine Liturgy. Other major services include Vespers and Orthros (Matins). More properly termed holy mysteries, the Church's entire life is one of sacrament. In the mysteries, the Christian is united with God, becoming a partaker of the divine nature (II Peter 1:4). With all the sacraments, God makes his presence known in his divine energies, using physical means to convey Himself to His people. There are seven generally recognized sacraments, though the number has never been fixed dogmatically by the Church. Two are sacraments of initiation into the Church, baptism and chrismation. Another completes the initiation and nourishes the life of the Christian, the Eucharist, which is regarded as the highest of the sacraments. The remainder of the sacraments are occasional: holy unction for the sick, confession for repentance and reconciliation with the Church, marriage for those joined in the marital community, and ordination for those called to serve the Church in holy orders. All of the sacraments require preparation in the Church's life, and so may not be administered to the non-Orthodox. The one exception is baptism, which is the mystery that unites the Christian with Christ in the Church, bringing him from being a believer in Christ as a catechumen (one who is preparing for baptism) to a full member of the Body of Christ. 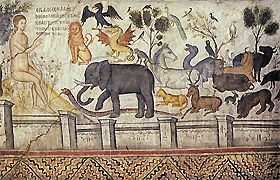 Adam naming the animals in Paradise. Orthodox Christian anthropology teaches that man was created by God to worship him in communion with him, made in his image to attain to His likeness. All human beings are thus of infinite value, because they bear the indelible stamp of their Creator. All human beings are composed of both a soul and body, which are permanently part of human nature. Man was created sinless, but not perfected, and so though Adam was pure when he was created, he was created as a being of dynamic progress, capable of growing more and more like God. At the fall of man, Adam and Eve not only sinned in violation of God's commandments, but their ontological state shifted. Their nature was not changed in itself, but the image of God in them became obscured by sin, which is an ontological separation from God. Fallen man is thus not totally depraved, but rather suffers from the disease of sin which renders holiness much more difficult to attain to. All of mankind suffers from the effects of sin (death, sickness, and all evils), even if a particular individual may theoretically not have committed any personal sins. Guilt does not enter into Orthodox anthropology, since it is essentially a legal category and not directly relevant to the existential reality of man's sin illness. Thus, even if the term original sin is used in Orthodox theology, it is understood not as a transmitted guilt for Adam's sin, but rather as an inherited disease which may be cured in salvation, enabling the Christian thus to return to the dynamic path of growth in God's likeness. Soteriology is the doctrine of salvation. In the Orthodox Church, salvation is understood as theosis, the infinite process of becoming more and more like God. It is also termed deification or divinization, and its meaning is that the Christian may become more and more soaked with the divine life, becoming by grace what Christ is by nature. As St. Athanasius the Great said, "God became man so that man might become god." By participation in the incarnation, man becomes like Christ. Salvation is a process which encompasses not only the whole earthly life of the Christian, but also the eternal life of the age to come. It is often described in terms of three stages—catharsis (purification), theoria (illumination) and theosis (divinization). Salvation is thus not only becoming sinless (purification), but it is also a progress in being filled with the divine light. Additionally, it is becoming so filled with God in union with Him that the Christian shines forth with the likeness of God, sometimes even literally becoming a bearer of the uncreated light. Though these terms of three stages are sometimes used, there is much overlap between them, and the whole process is often termed theosis. It is only in and through Christ that man can be saved. Salvation cannot be earned, being a free gift from God. Its acquisition, however, requires man's cooperation with God, because God will not violate the free will of man. Thus, a life of repentance and participation in the sacraments is the means by which man cooperates with God. This cooperation is termed synergeia (synergy). In theosis, man becomes filled with the divine life. He takes on God's attributes, but he does not become merged with the Holy Trinity. There is union without fusion. Man can become a god by grace, not in a polytheistic sense, but rather in terms of becoming a son or daughter of the Most High by means of adoption. Thus, a classic patristic image of theosis is a sword held in a flame—the sword gradually takes on the properties of the flame (light and heat), but remains a sword. The Orthodox Church does not take a position on exactly whom will be saved or what happens to those who are not in the world to come. There are some who take a position of Universalism, like Kallistos (Ware) of Diokleia or Theodore of Mopsuestia while remaining Orthodox. Clergy are those in the Orthodox Church who have been called by God to fulfill specific functions of service and leadership in the Church. They are not worthy in themselves to fulfill these functions, but by the grace of ordination, God enables them to carry out His will. This is why after an ordination is complete, the word Axios! ("Worthy!") is shouted, not because the Church is affirming the worthiness of this individual to be ordained (since he has already been ordained at that point), but rather because they affirm that the Holy Spirit has descended upon him and done His work of changing the man into a cleric. Clergy are not inherently higher or better than the laity in the Church, who are also ordained to a specific ministry as the royal priesthood of Christ. The ministry of the clergy is, however, seen as a more intense and potentially spiritually dangerous role, since its business is the administration of the holy mysteries and the responsibility of the teaching of the people of God. There are two basic classes of clergy in the Church, those in minor orders and those in major orders. The minor orders which are currently in use in the Church are reader, cantor and subdeacon (in some traditions, cantors are not used because choral music is the norm). The major orders which have survived from apostolic times and remain permanent within the Church are deacon, presbyter (priest) and bishop. Saints may be understood in two senses. First, the saints are all those who are in the Body of Christ, the Church. Saint literally refers to one who has been set apart for God's purposes, which is the essential meaning of holiness. To be holy is to be set apart and thus has nothing particularly to do with one's personal worthiness. In the second, more common, sense, the saints are those whose lives have most clearly shown that they are set apart for the service of God. Their holiness, which is not their own but is Christ's, has shone forth so obviously that Orthodox Christians pay them great respect, which is termed veneration. This veneration is ultimately due to Christ's work and is a recognition of Christ in the saints. Because the Church recognizes the work of Christ in the saints, it undertakes the formal work of glorification (canonization), by which the saints are affirmed by God's people as being among the saved, that their lives may be imitated, just as the Apostle Paul urged us to imitate him as he imitated Christ. Liturgical services are thus composed for the celebration of the feast days of the saints, and their place as participants in the common worship of the whole Church is confirmed. This page was last edited on October 2, 2016, at 23:34. This page has been accessed 244,090 times.